Just a few days after their awaited break up finally came alive as many Kenyans had predicted, Vera Sidika is being already rumored to be having another hunk. Her ex-lover, Otile Brown, who Vera claimed dumped her, was recently on social media to share a rather hidden message that many believed was a dedication to Vera Sidika. “I’m good. Don’t hesitate. Have fun. Life is short,” he captioned a photo that has him smiling like he knew something more but didn’t want to say it. 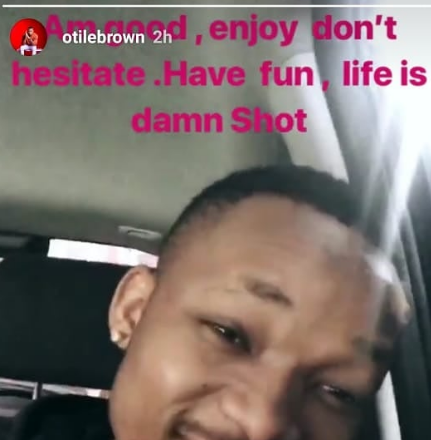 It might be just a caption, or perhaps Otile is trying to show his fans that he’s doing OK depsite what happened recently. Vera was on Monday topping the headlines after being spotted with another man on a date. She claimed that the guy was just a friend and the two are not dating. Vera and the unidentified hunk also went for a movie at Westgate Mall where they enjoyed The Equalizer 2.